Patients with more or less severe forms of rheumatoid arthritis (RA) may have the same painful symptoms, but does this mean that the cause of their illness is the same? And therefore that they should all receive the same treatment? Scientists at VIB and Ghent University have demonstrated with their research into inflammasomes that RA should be considered as a syndrome rather than a single disease. 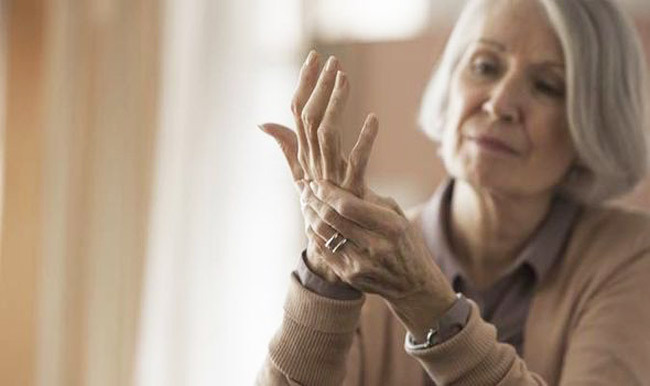 Rheumatoid arthritis and inflammasomes Rheumatoid arthritis (RA) is an inflammatory disease that affects the joints and without treatment it evolves into a debilitating and painful condition that can severely affect the patient’s quality of life. An estimated 1 to 2 % of the world’s population suffers from RA; this equates to approximately 5 million people in Europe. Inflammasomes are protein complexes that form part of our immune system. Scientists have suspected for some time that inflammasomes play a role in the development and progression of RA. Lieselotte Vande Walle and Mohamed Lamkanfi have been able to demonstrate the role of inflammasomes in RA using a specific mouse model with RA, developed by VIB colleagues Geert van Loo and Rudi Beyaert in Ghent. They were able to combat the development of RA by blocking inflammasomes. One of the processes accounted for by inflammasomes is the production of interleukin-1, a protein with an important role in inflammatory reactions. Stopping the effects of interleukin-1 resulted in a cure for the mice. In this manner, Vande Walle and Lamkanfi demonstrated that the mouse model is perfectly suitable for studying the correlation between inflammasomes and RA. A new therapeutic target This first mouse model that places the genetic focus on the inflammasomes also lays the foundations for developing new treatments. Previous research has already demonstrated that other proteins in our immune system — such as TNF and IL-17 — could possibly play a role in RA. Medicines have since been developed to combat these proteins and thereby cure RA. These research results demonstrate that a further therapeutic option could be the blocking of the inflammasome (or the resulting IL-1). Medicine to order The research by VIB scientists also demonstrates that RA is a syndrome rather than a single disease, in other words that similar symptoms can have various different causes. If one knows the cause, one can offer very targeted treatment. In the case of genetic forms of breast, skin and lung cancer it is already possible to predict with great accuracy — by means of genetic tests — whether a treatment will work or not. We could evolve towards a more personalized approach for RA too. People with RA may all have the same symptoms, but the underlying genetic causes can differ. And so the future treatment options will differ too. A new challenge for many scientists! The study done by VIB – Flanders Interuniversity Institute for Biotechnology.